There are three intermezzi that make up Brahms' Op. 117. 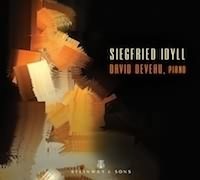 All have slow markings and divulge the growing tendency in the composer's late piano compositions toward serenity and meditative moods. This Intermezzo in E flat major encompasses much else of late Brahms, having that consoling and almost angelic manner in its outer sections and a quite serious and dark ponderousness in its middle section. This Intermezzo is a lullaby and carries slightly different markings for its three sections: Andante moderato, Piu adagio, and Un poco piu andante. Brahms prefaces the music with a quote from a favorite Scottish cradle song: "Balou, my boy, lye still and sleep, it grieves me sore to hear thee weep." The year he composed these intermezzi, Brahms lost his sister Elise and his longtime friend Elizabeth von Herzogenberg. Thus, the darker character of the work -- and the others in the set -- is easy to understand. The piece opens with a lovely theme, whose mellow character mixes consolation and dreaminess. The bridge passage leading to the middle section presents a darker variant of the theme. The music that follows is melancholy and troubled, though harnessed in by that typically Brahmsian philosophical manner, as if dignity must be maintained and emotions controlled in times of grieving. The main theme returns and the piece quietly ends. Typical performances of this Intermezzo last five minutes.